Kris Larkin has been cooking all of her life. She has had formal instruction in Italy as well as numerous schools and institutes in California. Being a lifelong student of cooking and discovering new ways to prepare favorite dishes combined with her incredibly positive attitude, makes her someone all can learn from. In the past few years, Kris, along with her husband sold their large (and demanding) Property Management business and moved to The Flint Hills of Kansas. They have purchased 3 little homes there which they have renovated into vacation guesthouses and one of them is host to Kris’ cooking classes. 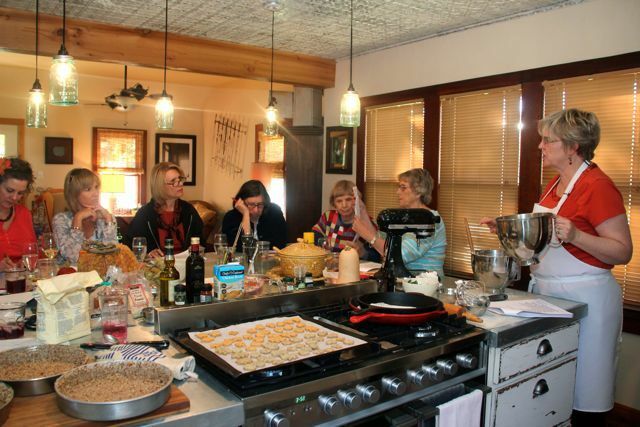 The cooking classes take the participant through just about every type of food you can imagine. So far the themes have been Grilling, Italian, Harvest, Holiday Brunches and Healthy – Get your eating back on track. the classes have been sold out from the start and now instead of just offering 1 class per month, Kris has added a second. Is a third class in the works . . . we’ll see! This blog is about recipes and sharing them with her readers.